Rare HOFer, this is one of the keys to any Old Judge run. 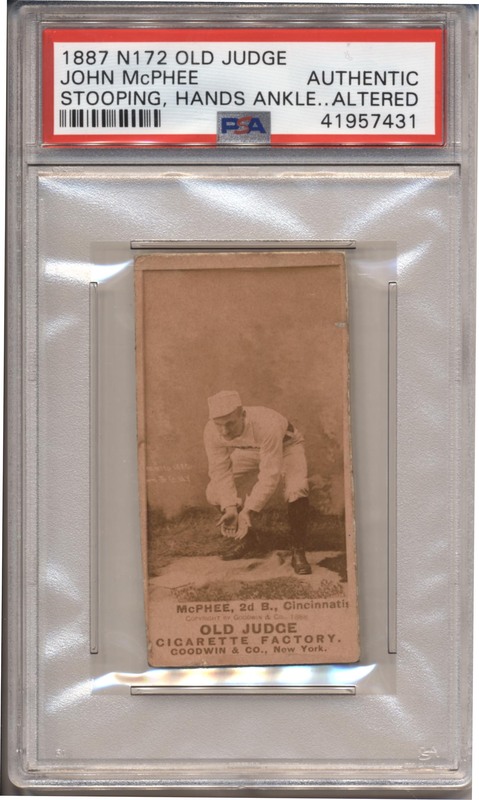 Missing from most Old Judge collections, these are needed by almost all HOF card collectors. The offered card has a beautiful image of McPhee bending down to field a ground ball. The front has a very fresh feel, the back has extra residue from scrapbook removal. The sides are cut at a slight angle, this may have been rebacked but we are not certain. Either way, this is a very attractive example of a truly rare and desirable Old Judge HOFer that is needed by many, many collectors.